For fans of fast-paced, classic themed video slots, Bonanza is perfect for you. 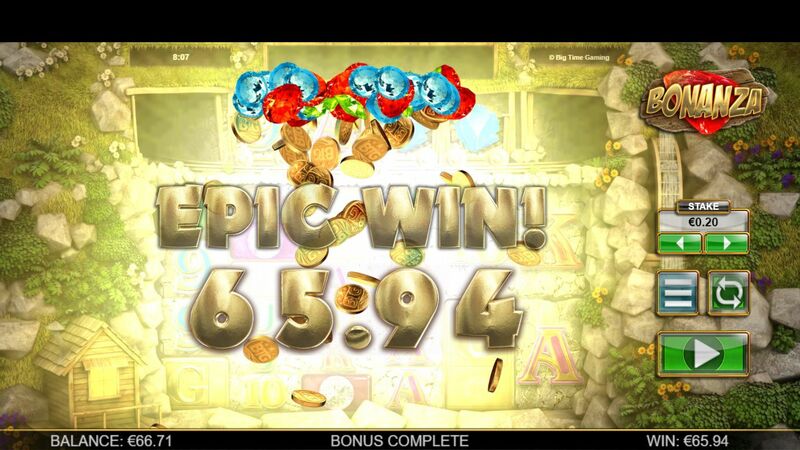 This slots site game has 6 reels and up to 117,649 ways to win - impressive! There is a free spins feature, expending multipliers and uses the megawatts mechanism which helps create the 117,649 winning combinations. 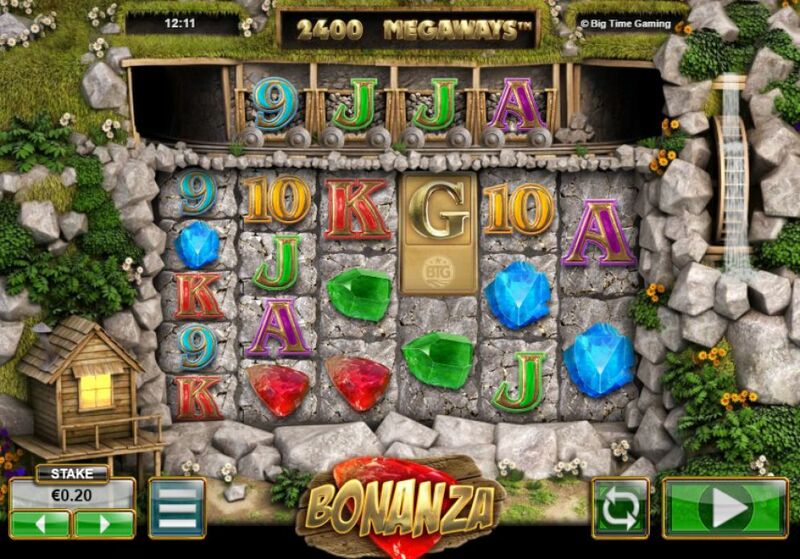 Bonanza is a mining-themed slot that has beautiful graphics and vibrant colours to create a memorable gameplay experience. Big Time Gaming software company are definitely in the industry ‘big time’. They were founded in 2011 and although they are one of the smaller developers in the online casino industry, they still have a successful track record and an excellent portfolio of games. The company was built by experts from the online gaming world so they knew they were off to a good start from the beginning! Their games include progressive jackpot games, online slots and casino games like blackjack and roulette. One of their other popular video slot titles include Lucky Street, which you can play on EasySlots.com. Themed to the mining industry, this cartoon style slot has beautiful graphics including grassy and flowery boulders and mining tunnels and the prospector's hut. The 6 reel slot uses megawatts mechanism system. This system allows any of the 6 reels to feature 2 to 7 symbols. Create a winning combination when you land symbols in reels next to one another. When this happens, the winning symbols will explode from the reels and instantly replaced by new symbols from above. This will continue until there are no more winning combinations available. Symbols on the reels include the lower paying playing card symbols (9, 10, J, Q, K, A) which can pay anything from 0.1 to 1.75 times your current stake for landing 3 to 5 of the same symbol. The diamond, red ruby, blue sapphire and green emeralds are the higher paying symbols. The diamond is the highest paying symbol and will award players with 50 times their current pay line for landing 5 in a row. At the top of the reels there are symbols displaying the four highest paying symbols and on every spin, these are added to the reels directly below giving you even more chance to score winning combinations. The wild for this Bonanza slot is the dynamite sticks which will replace all other symbols other than the scatter symbol to help form winning combinations. The scatter symbols for this slot are the letters G, O, L, D and if you land 4 of them on the reels, the Free Spins bonus feature will be triggered. Once activated, you will be given 12 free spins! During your free spins, exploding reels become active and a multiplier is applied to any wins. The multiplier starts at one and increases by 1 for every combination explosion you make. The bars of gold will also give you 5 free spins when you land 3 so keep an eye out for these. Discover our new casino slots free spins here. Join today and learn how to deposit by mobile. Adding a modern, slot theme to the classic rock and gem type of video game, Bonanza is a fun slot for players of all interests and abilities. If you enjoyed playing Bonanza, you can discover more online slot games here.